If checked, this option causes AB Commander to display the flat-style images on its toolbars and drivebars. If this option is cleared, then the "old" style, non-flat images are displayed instead. 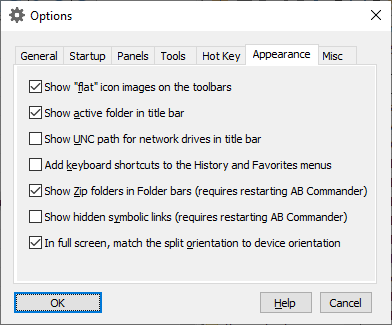 If checked, this option causes AB Commander to display the path to the folder currently listed in the active panel on the title bar of its main window. If checked, this option causes AB Commander to display the UNC path (in the format \\server\share\path) in its title bar when displaying folders located on the network drives. If this option is cleared, the appropriate DOS path (in the format D:\path) is displayed. NOTE: This option is enabled and takes effect only if the Show active folder in the title bar option is checked. If checked, this option causes AB Commander to add the keyboard shortcuts to the commands displayed on the History and Favorites menus of AB Commander. If checked, this option causes AB Commander to display the hidden symbolic links (such as My Documents, My Pictures, etc.) that Windows Vista and 7 create for compatibility with the older programs, but which don't actually serve any useful purpose (clicking on them results in the Access Denied message). You may want to clear this option to hide such symbolic links and stop them from cluttering the file listings. Note that this option only has effect if you have enabled the Windows Folders option to display the hidden files in the file listings.